Just as a traveler crossing a continent won’t sense the curvature of the earth, one lifetime of reading can’t grasp the largest patterns organizing literary history. 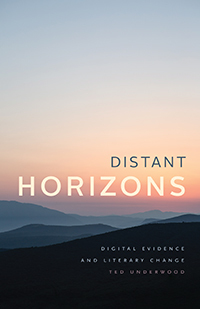 This is the guiding premise behind Distant Horizons, which uses the scope of data newly available to us through digital libraries to tackle previously elusive questions about literature. Ted Underwood shows how digital archives and statistical tools, rather than reducing words to numbers (as is often feared), can deepen our understanding of issues that have always been central to humanistic inquiry. Without denying the usefulness of time-honored approaches like close reading, narratology, or genre studies, Underwood argues that we also need to read the larger arcs of literary change that have remained hidden from us by their sheer scale. Using both close and distant reading to trace the differentiation of genres, transformation of gender roles, and surprising persistence of aesthetic judgment, Underwood shows how digital methods can bring into focus the larger landscape of literary history and add to the beauty and complexity we value in literature. 1 Do We Understand the Outlines of Literary History?